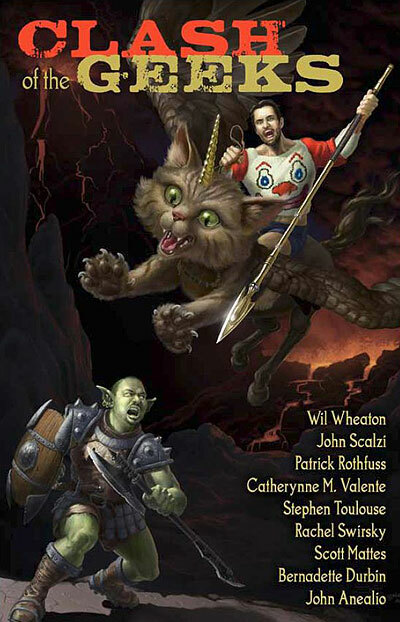 Wil Wheaton, John Scalzi and Subterranean Press are proud to announce the publication of Clash of the Geeks, a special and fantastical electronic chapbook featuring stories by Wheaton, Scalzi, New York Times bestseller Patrick Rothfuss, Norton Award winner and Hugo Best Novel nominee Catherynne M. Valente, Hugo and Nebula Award nominee Rachel Swirsky and others, for the benefit of the Michigan/Indiana affiliate of the Lupus Alliance of America. The chapbook is free to download, but voluntary payment is strongly encouraged, via Paypal or by tax-deductible donation forms, both linked to later in this entry. All proceeds from this chapbook will go to the Michigan/Indiana affiliate of the Lupus Alliance of America. Please enjoy the stories, link your friends to this page — and give! I heard about this via Subterranean Press, and it's a cool thing these folks are doing. 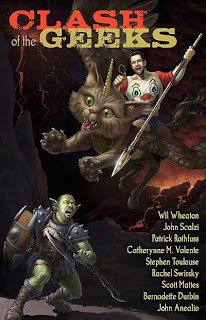 From the perspective of the reader, a lineup that includes Scalzi, Rothfuss, Valente, and Swirsky is fantastic. You WANT this chapbook. That all the proceeds go to charity only makes this cooler. You'll get some quality fiction and help out some folks. For more details, go to the official page here. Then, download the chapbook and donate some dollars.